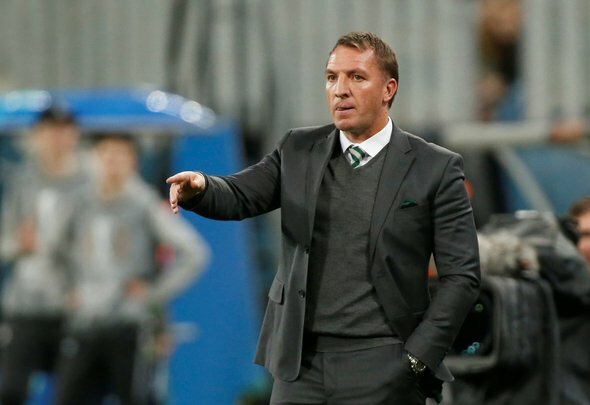 Brendan Rodgers is predicted to make just the one change to Celtic’s starting line-up ahead of the Europa League round of 32 clash against Valencia at Parkhead on Thursday night. Emilio Izaguirre could return from injury after missing the 5-0 win against St Johnstone on Sunday, meaning that Jonny Hayes could be axed from the left-back slot. Senior player Hayes, 31, started the Scottish Cup clash due to Izaguirre and Kieran Tierney being injured, but Rodgers suggested last week that the Honduran left-back’s injury isn’t serious, so there could be a chance of him playing in the first leg fixture against Valencia. Scott Bain is predicted to start in goals over Craig Gordon once more with the former Dundee shot-stopper emerging as the number one choice since the winter break. Jeremy Toljan could earn his European debut for the Hoops having been included in the Europa League squad. He could line up in a back-four alongside Jozo Simunovic, Dedryck Boyata and Izaguirre. Celtic’s midfield has been choosing itself lately, so that means that Scott Brown and Callum McGregor could occupy the deeper central roles behind Ryan Christie as the No 10. 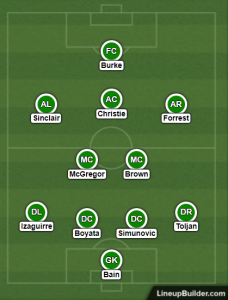 James Forrest and Scott Sinclair are pretty much nailed-on to start on the wingers while Oliver Burke could also make his European bow for the Bhoys by starting up front again.